at the Beanfield Centre at 8:00 a.m. The 49th edition of CSHP's Professional Practice Conference will be held at the Beanfield Centre (at Exhibition Place) in Toronto, ON from February 3 - 7, 2018. This annual conference offers hospital pharmacists, from across the country, learning and networking opportunities with their colleagues and corporate supporters. 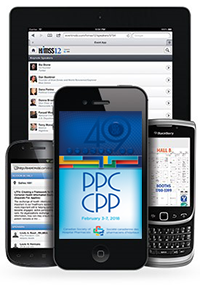 The PPC 2018 app is ready to be loaded on to your devices. The app will provide attendees with all the information needed to get the best out of PPC 2018.
share on social media, all before you ever arrive in Toronto. Best of all, the app is accessible from all devices with an internet browser: smartphones, tablets, laptops, and even desktops. The app has been pre-loaded with a list of attendees that gave CSHP permission to do so. If your name is already pre-loaded, please login to get access to personalize your profile. The app replaces the full-sized printed PPC program. There will be a pocket schedule printed and available to all delegates. Any session presentations provided by speakers will be available as they are received. Please check back regularly as the contents of the app will change regularly as files continue to be uploaded. The EventMobi server is housed in the United States of America. Student & Resident Networking Reception - hosted by the Canadian Pharmacy Residency Board, this networking event brings together students and residents with hospital pharmacists who are there to answer questions and share their career experiences. Registration here. Career Opportunities Evening - Are you looking for a job? Maybe looking to relocate? Everyone is invited to come and talk to representatives from Health Authorities who are looking for the perfect candidate(s). There is no cost to attend this event and you don't have to be registered for PPC to attend. Do you represent a hospital or health authority who are recruiting? Register here to book your space at Saturday evening's event. Her video testimony on the merits of Canadian vs. American health systems in a U.S. Senate Subcommittee hearing in Washington, with Senator Richard Burr and Bernie Sanders, went viral and has since achieved over 31 million views. In a recent Facebook Live interview with Sanders, Dr. Martin expressed her support for the Medicare For All bill, which would introduce a single-payer health care system also in the U.S. In 2006, her first year of practice, Dr. Martin helped launch Canadian Doctors for Medicare, representing Canadian physicians who believe in a high quality, equitable and sustainable health system, and chaired its board until 2013. She went on to help found the WCH Institute for Health System Solutions and Virtual Care – a hub of innovation dedicated to solving the health gaps in our system. In 2015, Dr. Martin was named Canada’s eighth most powerful doctor by The Medical Post, and in 2013 was named one of The Toronto Star’s top “13 People to Watch”. She appears regularly on CBC News Network’s Morning Show with Heather Hiscox, writes a monthly column for Chatelaine magazine and has been featured on National Public Radio’s All Things Considered and in USA Today. There is very limited availability at the Radisson Admiral Hotel - Toronto Harbourfront. The Room block is sold out so any rooms remaining could be at a different rate. We don't have any special rates and don't know the availability at these properties. Get a discount on your travel with UP Express! Are you flying into Toronto Pearson International Airport and need to get downtown Toronto for the Canadian Society of Hospital Pharmacists, 2018 Professional Practice Conference, be sure to take advantage of the UP Express group program – and get tickets at 25% off! Just visit UPexpress.com before February 1, 2018 and use promo code CSHP2018 to get your discount on adult return tickets from Pearson Station to Union Station. It’s that easy! UP Express tickets can be easily purchased at UPexpress.com. To get the 25% discounted group rate, attendees just have to use the promo code CSHP2018 on their adult return tickets (Pearson Station to Union Station) during purchase. UP Express connects Toronto Pearson International Airport to Union Station in the heart of downtown Toronto (steps from the Metro Toronto Convention Centre) in just 25 stress-free minutes—less than half the time it often takes by car. Trains leave every 15 minutes with the first train departing Pearson Station at 05:27 and the last train departing at 00:57. There’s no easier or more convenient way to get to or from Toronto Pearson. For more information, contact the Event Planning & PSN Administrator, Susan Maslin.